Today we talk about two updates on previously written posts and another nice Colorado bike ride. First - I did a short climb today up Chicago Creek Rd (Colorado State Hwy 103) to Echo Lake Lodge and took exactly zero photos to share. I realized this while descending at rapid speeds, but since that was going pretty well I saw no point in stopping. At the top I had met a number of interesting cyclists who apparently were a distraction from photography, including one guy who was planning on doing La Marmotte in France (108m, 16.990 ft) in two weeks and was spending his day climbing up and down and up and down the same roads near Mt Evans. Basically I climbed the road to Mt Evans (the highest paved road in the United States) from the Idaho Springs side. In this neck of the woods (literally inside the Arapaho National Forest) all roads lead to Echo Lake Lodge where water refills await and an endless stream of cyclists flow in and out. Those who have good timing, or good weather, continue another 15 miles (24km) to a parking lot just short of the 14,265 ft (4,348 m) summit of Mt Evans. As I climbed I kept thinking, I cannot believe my nephew won Cat 4 at age 21 in the Mt Evans hillclimb a few years ago - it is a tough road to race. Weather was looming today when I reached Echo Lake Lodge. From the sight of the shaking cyclists who had just descended from the peak of Mt Evans, I made the correct decision to turn around and glide back downhill 13.75 miles to the town of Idaho Springs. I returned home, showered, and went to yoga class in Denver under the sound of thunder and raindrops. I rode the entire ride today and never took a photo, not one, oops, but I do have a post I wrote in 2010 to share with you, same road, with photos! : Colorado High. This one image below may best describe my climb today. 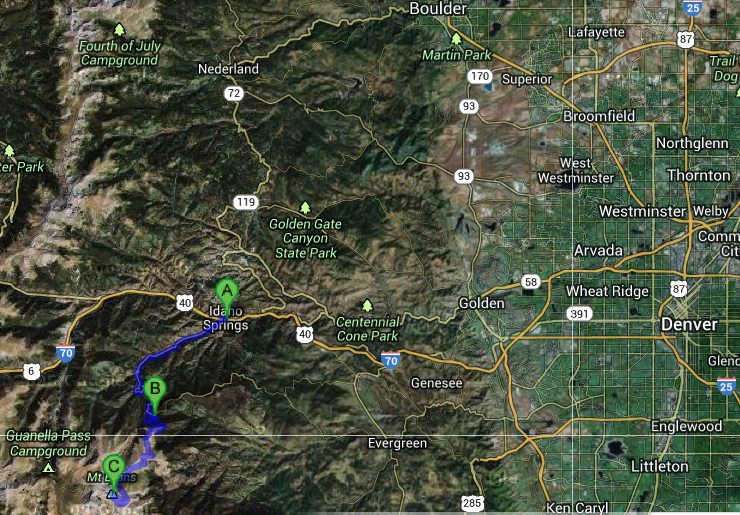 Ride: Idaho Springs to Echo Lake, 13.75miles one-way, 3028.22 ft elevation gain, max elevation 10,663ft. Mt Evans is west of Denver, and the closest to Denver of Colorado's 54 fourteeners. Second - an update to Protect your noggin, the post I wrote about the scary state of safety when it comes to bicycle helmets and the long wait for a MIPS helmet for road cyclists. The news is that Scott has a MIPS helmet for sale in bike shops, but not all shops, so you may have to special order one. Although the helmet is available now, it is pricey at $220. As demand rises perhaps protecting our brains from concussions will not be such an expensive deal. The prevalence of head injury and its association with cycling is a scary reality to me since I can quickly name off 5 people I know who have affects of brain trauma. From Bruce Barcott, read and use the Store Locator: http://www.brucebarcott.com/2013/05/here-are-the-mips-helmets.html. Third - an update to Chip and PIN Credit Cards, another post about traveling and the annoyance of old fashioned American credit cards that restrict our flow of currency while being tourists in Europe. More American Banks have come out with Chip and Signature Cards. Two now offer true Chip and Pin cards, a higher security method of using plastic. Good news is that you can at least get a Chip and Signature card for zero annual fees and zero transaction fees. From The Points Guy, read: http://thepointsguy.com/2013/05/us-credit-cards-with-smart-chips/. If you must have one, the only two Chip and Pin cards are from Commerce Bank Visa Signature Card, and Andrews Federal Credit Union GlobeTrek Visa. Fourth - the 100th Tour de France (not to be mistaken with the 100th year of the Tour de France, which was in 2003) begins NEXT weekend. Are you ready? I can't wait to watch and write about the Tour as it travels through some wonderful cities and countryside, many of which we have visited over the years. The Tour de France to me means travel memories combined with the unknown of bike racing. Especially a bike race which extends over three weeks. Ignore the pre-race predictions, no one truly knows who will win the 2013 Tour de France. 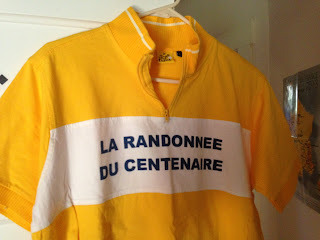 I dug out my old La Randonnee du Centenaire jersey from 2003 when I participated in the citizen ride through the streets of Paris before the final stage of the 100th year of the Tour de France. 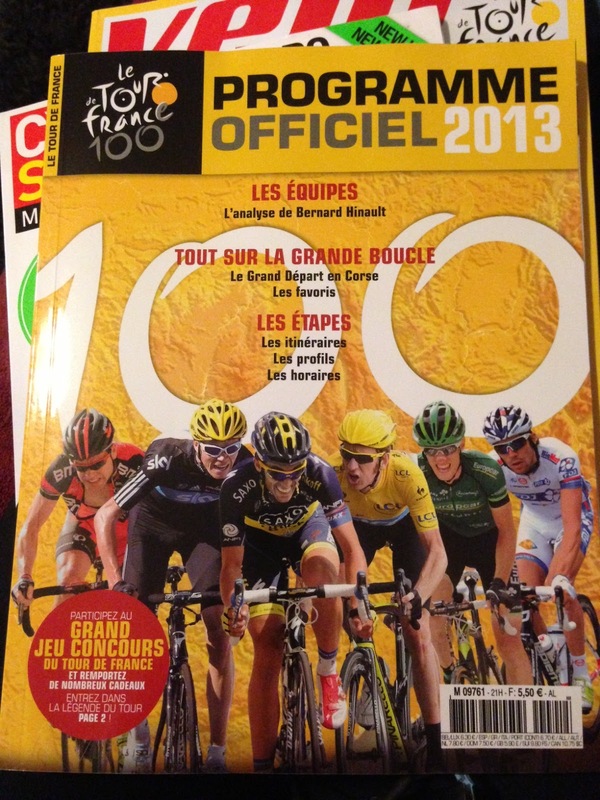 My brother Mike brought me back from France this programme officiel Tour de France 100 guide in French! 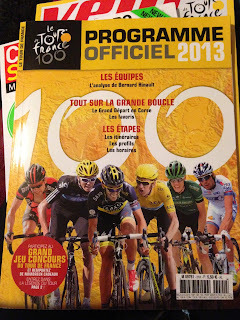 It will be my challenge to read the pages during the not as exciting stages labeled en ligne (flat stages). Too bad Bradley Wiggins, featured on the cover above, will not be back, nor will Bernie Eisel, Thor Hushovd, Chris Horner, Tyler Farrar, Dave Zabriski and a shocking number of the recently crowned National Champions from today's races around the globe. But Ted King made the cut, so did Jens Voigt. And we'll get to see Mark Cavendish sprint against Peter Sagan, Greipel, and Matt Goss. Next Saturday - the Tour de France begins on the Island of Corsica.